I have occasionally referenced Wikipedia as a source for noncontroversial material, such as areas or populations of countries. But I have been very leery about using Wikipedia references for controversial or politically sensitive topics. Wikipedia has some fundamental problems. Ironically, these problems stem from what are touted as Wikipedia’s greatest features. Wikipedia brags that “Anyone can be a Wikipedian—including you. Just click the edit link at the top of any page, or one of the ones at the beginning of each section.” Sounds good, Wikipedia has empowered you, right? But they have also empowered everybody else: those with an axe to grind, a cause to promote, a zealotry to advance, a grudge to nurse, a bone to pick…you get the idea. An obsessive person or group of people with time on time on their hands can work to sway public opinion on controversial subjects by simply slanting hundreds or thousands of articles to their liking. If an opposing view does not have a similar determined group to keep vigil on all pertinent articles, battling edit for edit, impartiality and truth are the losers. Wikipedia is anonymous. People with an axe to grind, a grudge to nurse, a zealotry to advance, etc. are the greatest benefactors of anonymity. People who do good work are all too happy to sign their name to it. Look at this list of usernames of account holders at Wikipedia. This is just the first 500 of many tens of thousands. Some of my favorites in the first 500 are “!PoisonOfDoom!,” “!NT!M!DATOR,” and the new, but soon to be popular “!MMORAL.” The bottom line is that you don’t have clue if the person who last edited the wiki page you are reading is a tenured professor with two PhDs or a 24-year-old loser from Kentucky. If you have kids in school in the U.S., like I do, then you know that they are being indoctrinated with global warming alarmism. Teachers, who are often poorly informed or even scientifically illiterate themselves, assign projects and essays designed to “raise their consciousness” about the environment. Where do these kids turn for information? Wikipedia, of course. If you care about what goes into your children’s heads, then the William Connolley debacle illustrates the danger of Wikipedia. Wikipedia may be useful, but should never be trusted. Always check the sources. I will never, NEVER cite Wikipedia as a source again. 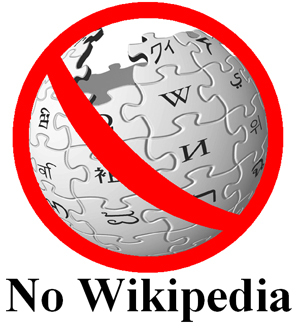 I have placed a “No Wikipedia” logo on the upper left corner right side of this blog. I encourage bloggers and website administrators to copy one of the following versions of this logo to put it on their web pages as well. Thanks for the “heads-up,” but I became aware of this clown through info on the WUWT blog. However, I never thought of posting any type of prohibition against using Wikipedia as a reference until now. I’ll post one of your “logos” on the climateclinic.com website and figure out how to do same on my climateclinic.wordpress.com blog. Excellent idea. Spread the word. I’ll have one on my own site today. I am a science (physics) teacher in the UK. Science teachers like me are not science illiterate, but have a lack of accurate information sources to base our teaching on. And even if we want to teach an alternative, we are bullied into silence. The media is all pro-climate change, and all our high school textbooks have a pro-climate change slant (that is to say Global Warming is presented as a fact). Even if we have the information to object and the courage to teach the alternative, the kids themselves are so programmed to the Global Warming myth it is not worth trying. Curiously, it is the ‘kids’ who are now starting out on their careers who have never met an alternative view on this issue who are the worst. Often, I am a lone voice for sanity and reasoned debate. I understand the problem. Aware of the political and cultural bias built in to articles I have never used Wikipedia as anything but a starting point for others writing about any subject of interest. It is almost a cult. There are writers who have an interest they espouse and will stop any other knowledge about it being written in. Qi Gong and Kundalini Yoga are two such cases. These two exercises are believed to allow contact with supernatural forces. Standing and waving your arms and legs around in unison with a small group brings you in tune with the forces that create and maintain the Universe. Subliminal Distraction caused by eyes open meditation while there is movement in peripheral vision will cause the effects they claim to be supernatural contact. Thanks for the heads-up! I’ll be sure to add the logo to my blog as soon as I figure out how to. Looks to me like the logo is in the other left side. Good point 😉 I’ll change it. Added the logo to my blog. Thanks for creating this. Posted, referenced and commented. Found some other interesting sites on wikipedia also! Saw it over at TWAWKI’s. It’s in the sidebar, linked of course. To be fair, we can’t say that Wikipedia is any better or worse than the internet at at large regarding the veracity of it’s content. Pick an entry or pick a page, there’s a bias there – guaranteed. Not in this case. Wikipedia turned a blind eye and let this character edit over 5,000 posts to his liking. Add to that the fact many teachers/instructors/professors allow Wikipedia as a reference, and you’ve got trouble in River City whenever it came to the AGW issue. If this is an example of what can and does go on in Wikipedia, it should be a clarion call for those demanding at least a semblance of factuality. Agreed. Of all people, teachers and profs should be loathe to trust a source that has very little accountability, meaning accountability that has consequences for not getting it right. I wasn’t trying to say “Wikipedia isn’t bad” – I was trying to say that if you aren’t careful, any and all of them can be bad. I posted and used one of your gifs on my site, Tom. I’m with you on kicking Wikipedia to the curb. Thanks for the information. I will add this to my website as well. I’m a simple man and I don’t have a scientific education. But I do my best to grasp accurate information. I also believed in the global warming myth for a long time, until someday I stumbled upon an article that made me think. And then I looked up other sources and found that the science community doesn’t agree at all about those things that the mass media presented to us for years as fact. And ever since it also made me aware of Wikipedia’s danger when I saw that the articles about global warming on Wikipedia are biased. Sure, for some chap working somewhere at the IPCC for example, it’s easy to invest the time and ‘get the facts right’ as he likes Wikipedia readers to swallow them. I was simply shocked to see how biased those articles on Wikipedia are. And ever since, Wikipedia lost my trust as a passable source. The Wikipedia articles on global warming are propaganda of the worst kind, by simply blocking out the vast majority of critics. A good example is also the difference between Wikipedia sites from different countries. On the English Wikipedia page about global warming, for example, we have at least a little bit of counter arguments, although also there basically most of it left out on purpose. But on the German Wikipedia page about the same topic, it gets even worse. There, the whole text rather sounds like a manifesto in favor of the CO2 theory, presented as solid, scientifically proven fact, blocking out ANY critcism or harshly presenting the little alibi criticism they allow, as something that doesn’t have any credit or merit. Wikipedia should change its policy and force editors of sensitive articles to validate their identy and making them public, so everyone can see who wrote the article. So, if Wikipedia should be banned because it is not always accurate and impartial, then should TV. How often is the news 100% accurate and 100% impartial? Rather than banning everything, people should be educated. Yes, Wikipedia often has incorrect and impartial information. Instead of saying “No Wikipedia!” instruct people on how to recognize impartial information (and even to bring attention to in via http://en.wikipedia.org/wiki/NPOV and the like) and how to check the information presented (and to bring attention to lack of citation via http://en.wikipedia.org/wiki/Template:Citation_needed ). Wikipedia is a great thing, even if it does have some problems (doesn’t every great thing have problems?). Rather than banning it because it has problems, lets fix them so that everybody benefits. Here are my exact words “Wikipedia may be useful, but should never be trusted. Always check the sources. I will never, NEVER cite Wikipedia as a source again. ” The point is that it should never be CITED as a source. By the way, I have not watched TV in years. But I do not endorse banning it. Please keep your head in the sand ClimateSanity so the rest of us can work to solving the problems of world and idiots like you can complain about them with closed eyes and your mouth full of dirt . I had a Wikipedia site up about an ongoing aircraft project of interest. One day I posted a link to an article in the American Thinker about the Cloward Piven Strategy on a page. Was very relevant and the AT page was factual. Boy, did I unleash a firestorm of leftist hate. The supposed wiki ‘authors’ promptly deleted my aircraft page and banned me from ever posting on wiki again, and then removed the CPS link. Screw wikipedia, I don’t go there for anything now. Well said! I’ve been saying this for years about ‘Wiki’; while its ok for finding out black-or-white information it is NOT a trustwothy source for anything that has issue-complexity. Really the only time i’ll use it is if I’m looking for a musician’s album title or to see what team a certain MLB player was traded to. i thank everyday for wikipedia. anyone can know almost anything by simply searching one website. how gloryous. thank you thank you thank you wikipedia. btw do you know wikipedia has itself a crticisms page? Your faith is quite quaint. Well my problem with wikipedia is that it is normally impossible to trace the content back to a person. If I write a text book and you do not like what you read, you can look me up and discuss it with me. In the case of wikipedia it is normally impossible to find who wrote what. J’ai traduit cet article à l’intention des visiteurs francophones de mon site. 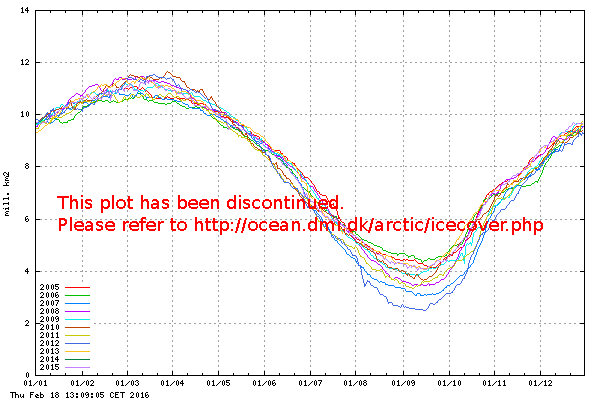 Yah, if I want the TROOTH I trust only CLIMATESANITY !! !